SPECIAL NOTES: Since code P0171 – “System too lean, bank 1” is generic code, it can set on any gasoline engine, but for various reasons this code is one of the most common codes to afflict V-type engines on Toyota applications. Therefore, this guide will briefly discuss the nature and causes of code P0171 as it relates to V-type Toyota engines. END OF SPECIAL NOTES. OBD II fault code P0171 is a generic code that is defined as “System too lean, bank 1”, or sometimes as “Fuel trim (FT) system too lean, bank 1”,and is set when the PCM (Powertrain Control Module) detects a lean air/fuel mixture on Bank 1 of a V-type engine. Note that a lean air/fuel mixture is a mixture in which there is more than 14.7 parts of air to 1 part of fuel present, and that “Bank 1” refers to the bank of cylinders on a V-type engine that contains cylinder #1. Like on all other applications, the engine and fuel management systems on V-type Toyota gasoline engines use various strategies to achieve, and maintain the air/fuel mixture at, or as close to the stoichiometric value (14.7 parts of air to 1 part of fuel) as possible throughout the engines’ operating range. As a practical matter though, Toyota engine and fuel management systems use input data from various sensors such as the throttle position sensor, MAF (Mass Airflow)/MAP (Manifold Absolute Pressure) sensor, engine coolant sensor, IAT (Intake Air Temperature) sensor(s), barometric pressure sensor, and where applicable, the boost pressure sensor to monitor the total volume of air that enters the engine. Based on this value, the PCM makes appropriate adjustments to the injector pulse width to ensure that sufficient fuel is available to bring the air/fuel mixture into the stoichiometric range. Moreover, and assuming that the engine is in good mechanical condition, that no unmetered air enters the engine, and that there are no exhaust leaks present, the engine management system also uses oxygen sensors in the exhaust system as “quality assurance” devices to monitor the composition of the exhaust gas. 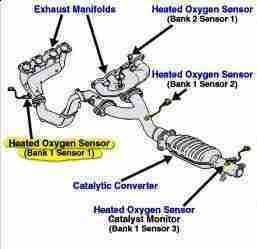 Note however that for oxygen sensors to provide accurate input data, they need to be in closed loop operation. In closed loop operation, the #1 oxygen sensor (located upstream of the catalytic converter) on a given bank of cylinders is rapidly switched between alternatively reading a rich and lean condition by the PCM. Thus, by switching the sensor between reading rich and lean conditions, the PCM manages to maintain the air/fuel mixture at stoichiometric by averaging out the extremes, by dint of adjusting the injector pulse width several times per second. In practice, the concentration of oxygen in the exhaust stream is an excellent indicator of well the engine and fuel management systems are managing the air/fuel mixture, since the oxygen content of the exhaust gas is a function of both the original air/fuel mixture, and the efficiency of the combustion process. So why does code P0171 affect V-type Toyota engines more than others? On these applications, poorly designed/unreliable/ unsuitable air/fuel ratio sensors, as well as a poorly designed right-hand exhaust manifold have a long history of causing code P0171, as well as additional codes P2195, P2197, P0138, P0158, P0174, P0031, and/or P0051. Toyota released a Technical Service Bulletin – TSB 0114-08 –, which recommends replacing both the left and right hand side #1 air/fuel ratio sensors with improved and updated sensors. The updated part numbers for the improved sensors are 89467-07030 and 89467-07040 for the left and right hand side sensors, respectively. A second TSB recommend replacing the right hand exhaust manifold with a redesigned unit, the part number being 17140-0P041. While defective or contaminated MAF sensors are a common cause of P0171 on these applications, it is more common for defective fuel pumps to cause this code along with P0174, which is the same problem, but on bank 2. If the residual fuel pressure on these applications fall below 21 PSI within 5 minutes of switching the engine off, the fuel pump is considered to be defective, and replacement of the pump is the only reliable remedy. The part number for the updated, improved, and redesigned fuel pump is 7702008040 for the Sienna, 232200P030 for the Canadian-made Lexus, and 2322031180 for the Japanese-made Lexus. Another very common cause of P0171 on the above applications is poorly designed and unreliable fuel injectors that tend to become clogged, which impedes the flow of fuel through the injector. The part number for improved fuel injectors is 232090P040 for both the Sienna and the Lexus. The image above shows the location of the #1 air/fuel ratio sensors on Toyota applications with V-type engines. However, note that code P0171 can have many causes other than unreliable air/fuel ratio sensors and fouled MAF sensors on the engines that are listed above. Some additional, but very frequent causes of P0171 are listed below.